23.08.2016: James Pull is set to compete in the BDRC British F3 season finale with Carlin. James Pull is set to compete in the BDRC British F3 season finale with Carlin. The 16-year-old driver will make the step up in the Championship’s final round at Donington as he explores his options for 2017. The ADD Motorsports-supported racer is currently enjoying an excellent season in the F4 British Championship with Carlin – where he is fighting for the title in fourth place. But he is also relishing the chance to take on a new challenge at his favourite track. He said: “It’s going to be a challenge, but I’m ready for it. I have done some testing in an F3 car and my times have been good, but I’m excited to be getting this opportunity. 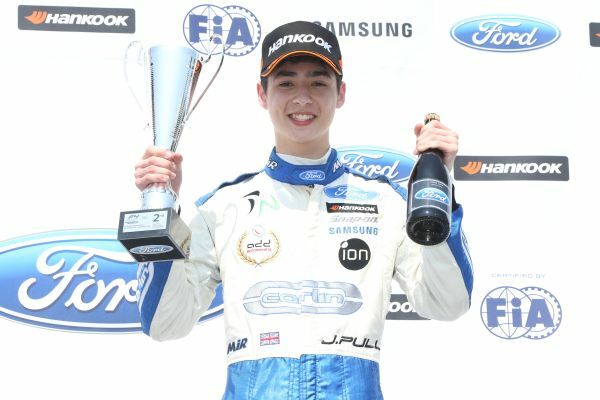 English driver James, born in Singapore, now living in Herts, is currently joint fourth in the F4 Championship – just 22 points off the leader. But with nine races across three rounds still to go, there’s all to play for. James will continue his title challenge at Rockingham at the end of August, before taking the seat vacated by Lando Norris – who has other race commitments - in the F3 on 10-11 September. The driver then heads into the final two exciting rounds of the F4 in September and October before making a decision about his future. Carlin racing director Trevor Carlin added: “We are delighted to welcome James [Pull] to the British Formula Three team in place of Lando [Norris] who cannot be with us. Fraser Sheader, director of performance and management team ADD Motorsports added: “It’s a great opportunity for James to sample the BDRC British F3, as it’s certainly one of his options for next year. Carlin’s Jordan King win race three, Giovinazzi takes race two.